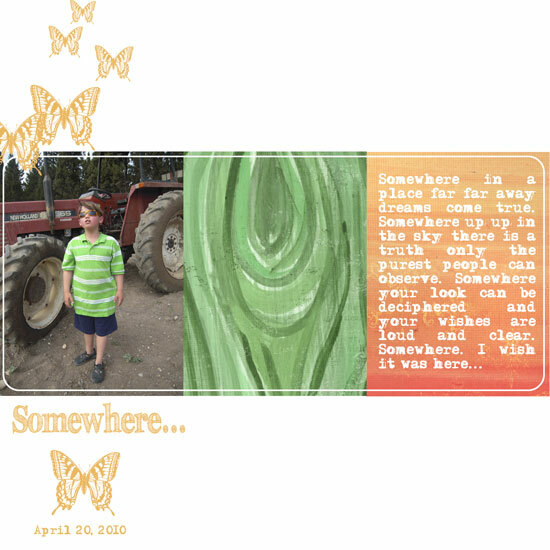 Journaling Prompt – One Event. Two Perspectives. In 1991 the Gulf War had reached Israel. 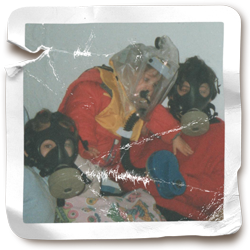 Iraq bombarded Haifa and Tel Aviv (and other nearby cities) with Scud missiles and the word had it that the launched missiles may contain nerve agents, so we had to wear a gas mask every time the siren went off and get into an air-tight shelter. I was 10 at the time. I can only imagine what my mother and father felt at the time. It must have been hard for them. They had 4 daughters: 16, 15, 10 and 2 year-old. They had to make sure we wore our gas masks properly. They had to lug their gas masks to work and worry about us and what we are going to do if the siren went off when thy’re not at home. They had to clean the shelter and move our mattresses there. they had to make sure we have a TV set and enough toys and knickknacks to keep us busy. For them it couldn’t have been easy. For us [me] it was fun. I had a prolonged slumber party with my best friends who happened to be my neighbors. We didn’t have to go to school (after a while) and could go to sleep late at night and sleep in the next day – as long as the siren didn’t go off… Fun times. Write about an experience you’ve had but take two different perspectives. It is a good learning experience and a very good writing drill. 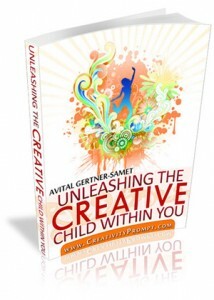 Check out Creativity Prompt’s new and unique self paced workshop: “Welcome Little One”. This workshop will provide you with everything you need, and then some, to make a fabulous handmade mini album to record the first moments of a new born baby. There must be but a couple things more beautiful than a sunrise, but I haven’t seen them yet. The anticipation in the pre-morning frost is immense. The teeth are shaking and the entire body shivers with both cold and excitement. Making them visible in the dark cold black sky. Already the ridge lights up welcoming the rising sun. A few more moments elapses and the red rays are accompanied by an orange mist of color. Almost obscure at first but soon the orange dominates the brave, pioneering red lights. Then the sky change color to a magnificent cobalt blue. followed by a fabulous ball of pure shining gold. 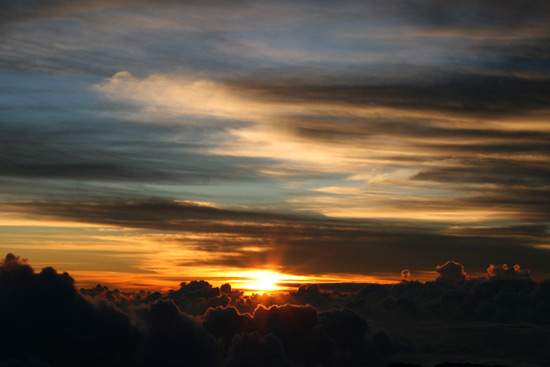 The sun is coming up and sky once again change color to a perfect azure hue. What an inspiration are those young first rays of sun that singlehandedly take over darkness. It only takes one ray to light up half a globe. How did it look like? What colors did you spot? Where did you watch the sunrise? With whom did you watch the sunrise? Have you learned anything from your experience? How has the sunrise inspired you? What did you like most about the sunrise? What do you think was the most beautiful moment? Have you ever watched the sunrise? Check out Creativity Prompt’s new and unique self paced workshop: “Make Your Own Planner”. This workshop will show you how to make a beautiful handmade planner for the year 2012. Not only are you going to get the entire meticulously designed planner kit for instant download, but you will also get a high resolution video tutorial as well as step-by-step instructions to guide you on each step of the way. Either treat yourself with a fresh and creative start for the coming new year, or get it to create wonderful gifts for your family and friends. I never believed I will be ziplining at over 50 mph, just flying between heaven and earth until November 24, 2010. The day I did it. At the first zip line my heart skipped a beat and I felt a shortage of breath, mainly because of the speed. However, on the first actual track I just enjoyed the breathtaking views and was amused that after Nadav had asked if it’s possible to stop before reaching the break, it was me who stopped and started going backwards, followed by the instructor who kept throwing the rope and I kept avoiding it, until I understood it’s the only way I can reach base… It was fun and it was fulfilling. I can always trust Nadav to afford me these once-in-a-lifetime experiences. 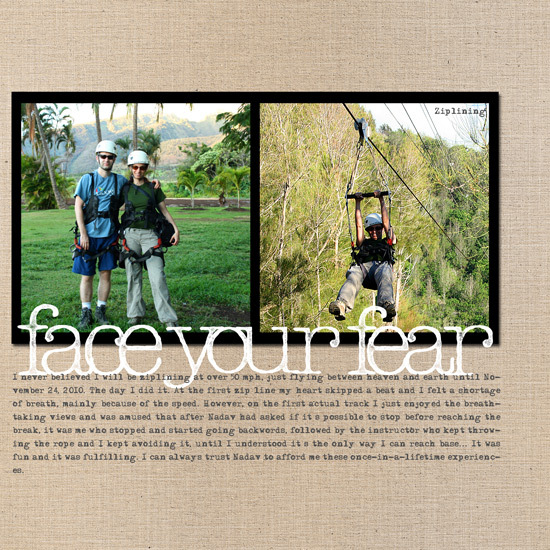 Have you faced any of your fears recently? It seems like I am developing a pattern here… All thanks to my dear husband. I am not a brave person. More specifically, I am TERRIFIED of snakes. I keep imagining there are snakes lurking whenever we go hiking in the woods or in a rocky trail. Therefore when my husband had the genius idea to put a HUGE snake around my neck – I wasn’t exactly happy about it. To say the least. But my husband has this quality about him to persist and insist until he gets his way. 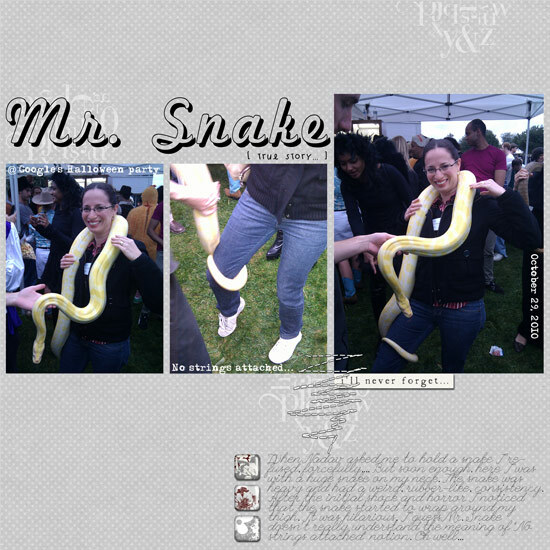 And so I ended up holding the huge snake. Breathing slowly, in and out. In and out. And I made it without a heart attack, or any other attack. It was rather amusing that the snake started wrapping its tail around my leg and didn’t want to let go. P.S. Did you check out yesterday’s Giving Thanks Journal workshop? It’s free. Karla Dudley’s new collection Be You has inspired me to look for a picture that can showcase who am I.
I do not have that many pictures of myself, as I am mostly on the other side of the camera… (not such a good idea) but I still have a few laying around. The pictures I have are from different times in my life, so they made me thinking of people and who they are. People change all the time. They change physically, emotionally, professionally, romantically and in many other ways too. However, even after a person changes he still carries around with him some of what he was before. I am not different. I carry with me lots of bits and pieces of what I have been in my life time. I carry with me an obsession for reading that my 5 year-old self sparked when she started reading on her own. I carry with me the resilience of my 6 year-old self who overcame a serious illness. I carry with me passion for fashion and design from my 11 year-old self who wanted to be a fashion designer and draw different outfits relentlessly. I carry with me the love of writing that my 15 year-old self used when she won two writing competitions. I carry with me the leadership and responsibility of my 17 year-old self who was the head of her school’s student body. I carry with me the fear of war and redundant hatred from when my 18 year-old self survived an atrocious murder but my best friend’s sister didn’t. I carry with me the sense of accomplishment of my 24 year-old self who got her license to practice law after 4 years at the university and a year as an intern. I carry with me a strong moral campus I got from my 25 year-old self who sought truth and justice and was willing to work 60-hour weeks, sometimes 76… to get it. I carry with me the joy of tying the knot with my one and only true love, my husband Nadav. I carry with me the adventurousness of my 27 year-old self who left everything and moved abroad with her husband of 3 months. I carry with me the ability to cope and adjust from my 28 year-old self who had moved again to another country in another continent, even farther away from home. I carry with me bits and pieces from every day I have lived on earth and every bit and every piece is making me who I am today. What are you carrying with you from your old self? Share by leaving a comment. I guess my birthday has put me in a reflective mood… Memories keep flooding me. Remote as well as recent ones are making me think and think and think some more about then and now. Once upon a time, on a sunny day in 1984, I took my doll on a trip in a park. I wore my favorite pink knitted skirt and my sraw stroller and I carefully rolled it up the trail that led to the park. 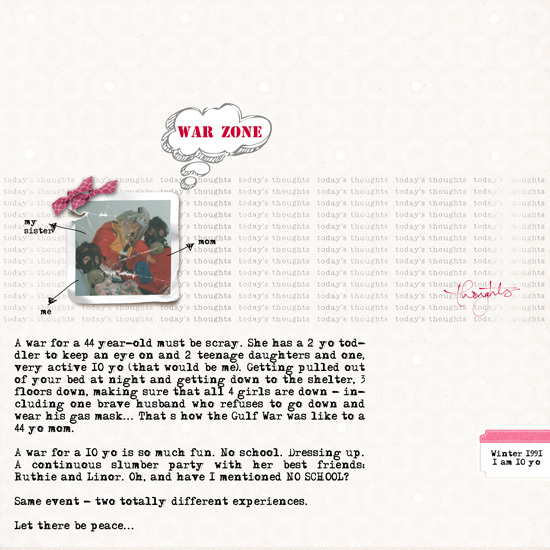 When I got there I squatted down and whisperred softly in my doll’s ear. I promised her that I will take care of her and love her. I promised that I will keep her warm and clean. I promised I will kiss and hug her as many times a day as I could possibly squeeze in my buzy (almost) 4 year old schedule. 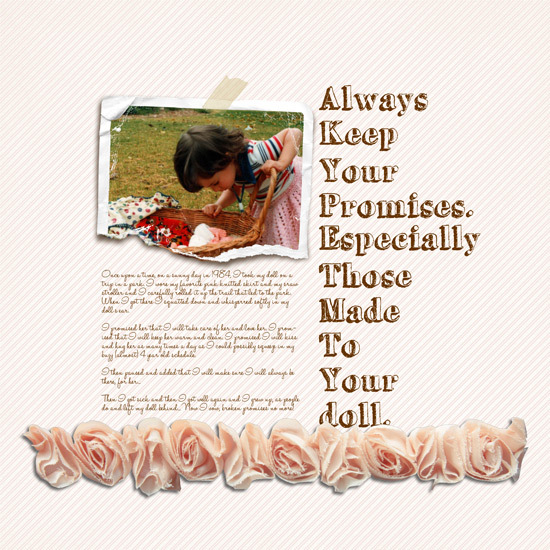 Then I got sick and then I got well again and I grew up, as people do and left my doll behind… Now I vow, broken promises no more! Under the sophisticated shell I am just a simple woman. I love to love and to be loved. I love to laugh out loud and to make other people laugh with me. I love to read. I love spiced hot chocolate. I love to think and conclude freely. I love to stay authentic. I love to travel and walk along trails surrounded by stunning landscape. I love to write. I love to look at past photos of the people I love and of events I enjoyed and reminisce. I love the feeling I have after a good workout and sometimes, when I can, I love to take a nap and hide under the covers. I love life and I love living fully and freely. I love to let my mind wander and to day dream. I love hot chocolate cakes and I love light cheesecakes and I love eating pizza from time to time and I love soups way too much. I love shopping. I love to dress up. I love to dress down. I love people and wish all the people loved each other, just as much. I love making up stories for little children. I am not that complicated but rather simple. I am tickeled, I am touched, I am filled with joy and I am hurt. I am happy and I am sad. I laugh and I cry. I am simply me. I am who I am. When was the last time you wrote about yourselves? Who are you? Please share and leave a comment here. I’d love to know you all better. I am an advocate of the story behind the photos. Saying that, I also think that sometimes the story can be depicted with just a few words. Sometimes the title alone will suffice to convey the moment. This layout is a terrific example. 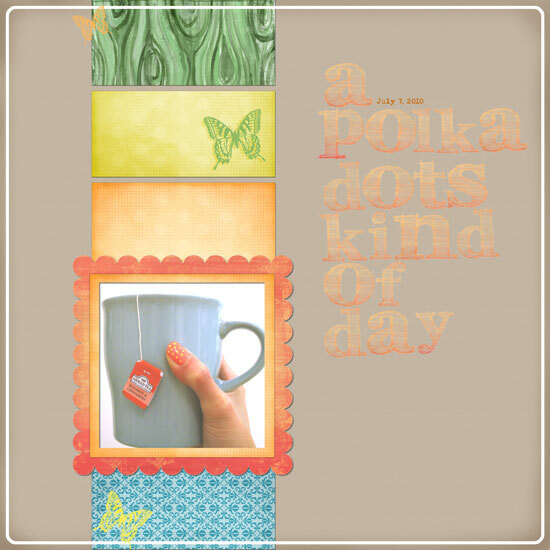 The title is certainly enough (in conjunction with the date and the photo) to bring back the memories from that long day that at the end of it I decided to paint bright yellow polka dots on my nails… Oh, what a day it was. What memory can you capture with a single title? I would love to hear your thoughts, so please leave a comment and share with me. Who said you can only journal about the past or only tell stories that actually happen…? Make a layout which is all about what you WISH would have happened or will happen. To jump start your wishing process, share one wish with me? What is the first wish that comes to your mind right now? Leave a comment and wish along with me. Check out Creativity Prompt’s self paced workshop: “Capture Your Dream”. In this workshop you will capture, follow and make your dream come true as well as document your journey in a fabulous mixed media mini album. Sometimes journaling on your layouts or mini albums can be a struggle. Fortunately, all you need is a jump start. One sentence that would get you going and tell your story. This week I am sharing a set of FREE journaling prompt tags that you may use exactly for this purpose (for personal use only). To download it simply click on the image (or the link) and if it doesn’t work try to right-click on it and opt for the “save target as…” option (it may be phrased a bit differently on different operating systems – but do NOT opt for the “save image as” option, as you will get the low resolution tiny preview image). I hope you like it and have lots and lots and lots of fun with it and tell many stories. 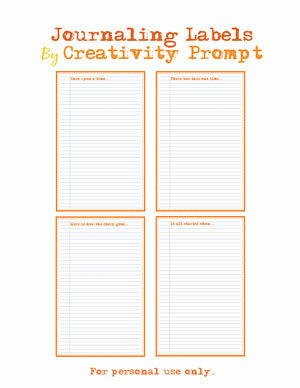 Make sure you didn’t miss the rest of the free printables on Creativity Prompt. I’m also open for suggestions if you think of a printable you would like to find here on Friday Freebie. Are you struggling with your journaling sometimes? What are you going to use these labels for? Leave a comment.